Resistance. It's that weird, self-defeating energy that holds us back from making progress, from getting started (or finishing). In short, from showing up for the things we KNOW we'll feel better for doing. When you hit a wall, kick it in. So that's what I did. For the sake of moving forward I charged ahead and ended up completing the first painting in a series of imaginative landscapes and delightfully, it's unlike anything I've done before. The experience was a reminder of what we're all capable of- more than we thought! And that we can show up for life even when we don't feel like showing up. I hope the process of transcending my own "ick" imbues the painting with a depth that is vivifying for the viewer. It is at once tender and hopeful. 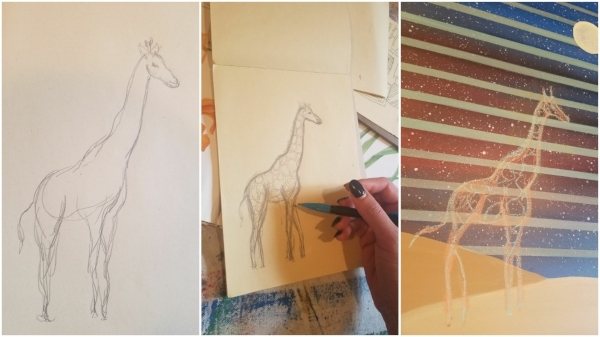 Giraffes, it turns out, symbolize perspective. Literally being able to see far in to the future (thanks to those long necks!) As well as quiet, gentle strength.